Due to the popularity of our March 26th event, during which we talked about the future of Virtual Reality and Augmented Reality, we have decided to take the next step, from theory to practice, and arranged a fully immersive evening of VR experiences with the leading VR simulation laboratory in NYC: The Hubneo VR Lab in Manhattan. High-resolution VR headsets are just one piece of the puzzle when it comes to creating truly immersive experiences in virtual worlds. Supporting systems such as motion simulation, haptic feedback, 360° spatial sound, and motion tracking are all major elements necessary for the future of the platform, without which VR will never feel real. The team from the Hubneo VR Lab is in the process of creating this future, by designing and building Full-Motion VR simulators. 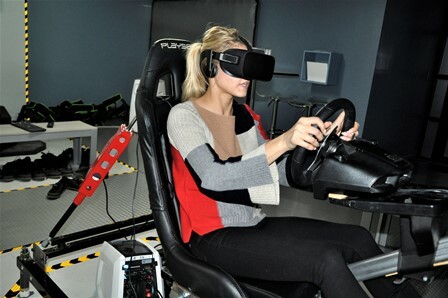 Their Lab in the LES, Manhattan also provides a space for people to immerse themselves in virtual worlds using state of the art VR equipment and several unique VR simulation systems. Hubneo’s simulators are tested and optimized based on the feedback from professional racers, pilots, and gamers. 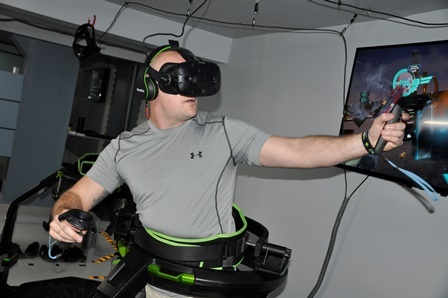 These interconnected simulation systems allow for an unparalleled level of VR immersion, while facilitating maximum levels of collaboration, social interaction and healthy competition between users. With this is mind, the goal of the coming Wharton event will be not so much to talk about VR, but to actually give all attendees an opportunity to immerse themselves in four unique types of VR simulation systems. This will allow the attendees to see that the potential in education, communication, and collaboration made possible by VR is something that goes beyond description. Our hope is that this event will foster a creative and informed discussion about the exciting possibilities that VR presents. Refreshments can be purchased until 8:00pm at Spreadhouse Cafe located directly next door. SH provides an excellent space to hang out and socialize between VR experiences, while the Lab is primarily dedicated to VR experiences. Anyone participating in the event can use the "Lab" discount to receive 10% off of their Spreadhouse purchase. Due to venue capacity limitations, you must pre-register for this event. Walk-ins will not be accepted. Registration is subject to availability and will close on Monday, May 27th at 3:00pm - No Exceptions!